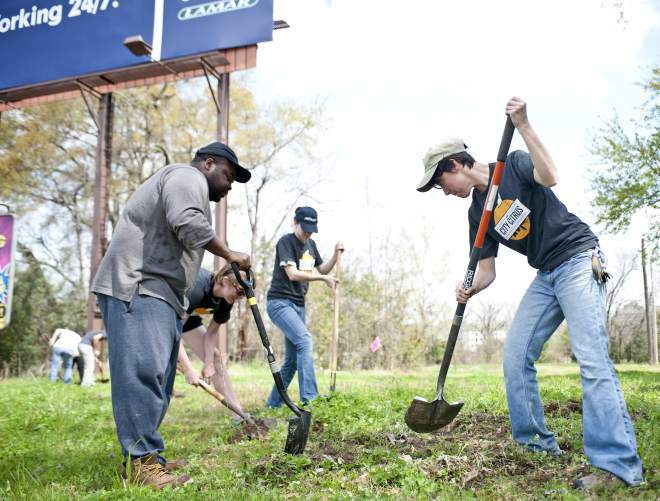 More than a dozen volunteers led by Baton Rouge Green and Slow Food Baton Rouge spent their St. Patrick’s Day planting satsuma orange trees at three sites in and around downtown. 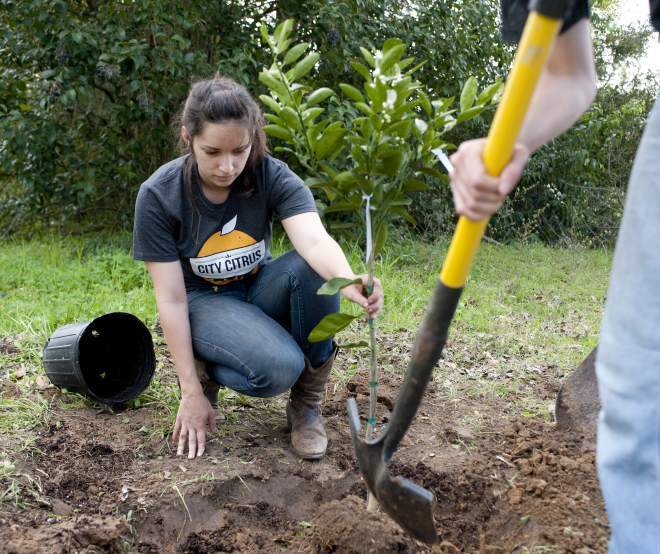 City Citrus, a joint effort between the two organizations and Lamar Advertising Corp., is starting small, but the ultimate goal is to have orange trees throughout Baton Rouge that are cared for by the community and produce fruit that is free for anyone who wants it. Call it open source citrus. Maggie Conarro, a Louisiana Delta Service Corps member working as garden and orchard coordinator with Slow Food Baton Rouge, said City Citrus encompasses a number of issues important to Slow Food: sustainability, improving access to fresh food, empowering people to grow their own food and re-purposing underused space. Crews planted 15 trees on land under Lamar billboards at of N. 10th and Main streets; South Boulevard and Highland Road; and West McKinley Street and Highland Road. The trees will bear some fruit in the next year but will reach their full potential in about two or three, Seemann said. The idea began with Winifred Reilly, an artist and wife of Lamar President and Chairman Kevin Reilly Jr. She felt the land under Lamar’s billboards could be put to some kind of higher use. The company approached Baton Rouge Green and, working with Slow Food, they began to put together a plan. “They had this vacant space that was maintained, but the potential wasn’t maximized and they wanted to do something with it,” Seemann said. Allie McAlpin, Lamar’s Marketing Communications Director, said Lamar will contribute space on its billboard to promote the project. Seemann said satsuma trees were an ideal choice for Baton Rouge. “They do very well in the summers and they survive … the cold snaps better than other citrus,” he said. The maintenance, pruning, cleaning and watering will be done by volunteer “citrus shepherds” — most likely a community, church or school group, or even just an enthusiastic volunteer. The latter is already the case with the 10th and Main site, which is also an organic site.Kevin Black, who owns Go Ya Ya crepes at the Main Street Market, called Baton Rouge Green immediately after learning about the program. He and his wife have been doing some home gardening and have three orange trees and a fig tree. Baton Rouge Green provided Black with a three-year plan, a spread sheet to track his work and some guidelines on maintaining the site. It’s work Black said he’s happy to do. Conarro said City Citrus is one way of combating food deserts — areas that are underserved by grocery stores and fresh food sources. But Conarro said that food deserts aren’t always in poor areas. Even Spanish Town residents, she noted, have to leave their neighborhood to go to a full service grocery store. Conarro, who works in local school and community gardens for Slow Food, said urban agriculture projects like City Citrus are useful ways to teach children about food. She said students will plant carrots and watch the little green leaves grow out of the ground during the fall. Then it’s time to harvest. Seemann said City Citrus could expand next year. 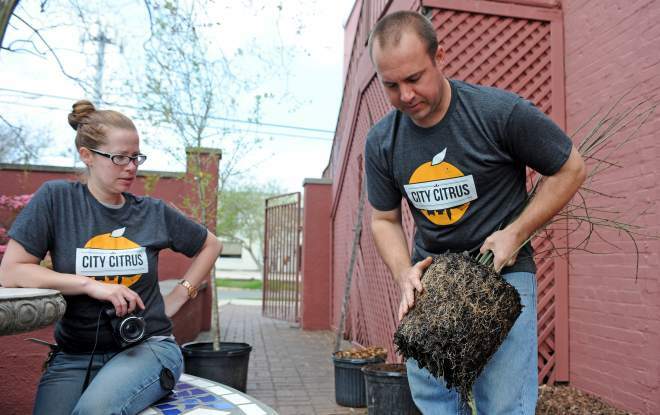 Much of the effort for the program was front-end work, designing an implementation process that could be easily scaled up as sites and volunteers become available, with City Citrus providing the support. “Our end goal is to make this bigger, we just have to add more people and more trees. Frankly, at a minimum this could be a regional project, or it could be a statewide or bigger project.” Seemann said he’d like to experiment with other types of citrus trees. The original article appeared on The Advocate's website.